The Bears returned home on Thursday to face the Seattle Studs for their second straight game, and it did not go as planned. The Studs scored six runs in the first, Highline struck out 17 times, as they lost to the Studs 11-0 at Mel Olson Stadium. Colin Cortez got his first start for the Bears this summer, and it definitely did not go they way he would have liked it to go. Cortez only lasted two-thirds of an inning, allowing three hits, three walks, and six earned runs. The recent high school graduate was able to get lead off hitter Connor Savage to ground out to Bryce Beck in the first batter he faced, and then it went downhill from there. The next nine batters he faced reached base, leading to Cortez getting pulled in the first for relief pitcher Cole Connolly. On the other side, Studs pitcher Geoff Brown pitched an absolute gem. The 29-year-old former minor league pitcher struck out 14 Bears, allowing only four hits in seven innings of work. 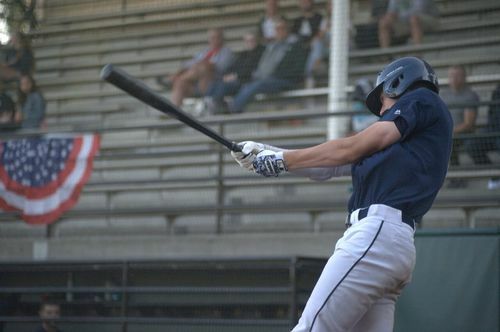 Highline’s bats never got going, as the only Bear who had multiple hits was Designated Hitter Kealan Martin, who was a late addition to the lineup, replacing Wednesday nights starter Ben Wadowski in the clean-up spot. Connolly pitched a strong game, only allowing 2 runs in four elongated innings of work. He also struck out seven batters, as his curveball and fastball combination complimented each other nicely. The Studs reached double-digits after pitcher A.J. Palmer allowed a two-run home run to Seattle’s shortstop Matt Zoba late in the game, which ultimately led to the 11-0 final score. The Bears finish their 11 game stint Friday night when they host Beyond Baseball. First pitch scheduled for 7:05 p.m. at Mel Olson Stadium.